Our school is conveniently located on Saint Clair Avenue, only minutes away from the I-90 Freeway, just south of downtown Cleveland. Please click here to see if your student qualifies for free transportation. 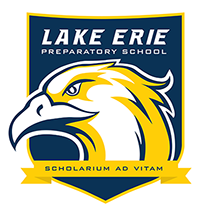 Lake Erie Preparatory School creates a culture of high expectations for behavior and academics through rigorous, research-based curricula and a focus on achievement. It is our goal that our students will attend a college preparatory high school and ultimately gain acceptance to, and graduate from, a four-year college. It is our expectation that 100% of graduates will positively affect change in their local communities while making a contribution to our global society!